Good morning, friends! My adventure for today will be horse back riding! I have a couple friends who are really into horses and even own a few, so every so often they’ll grab me and we’ll go out and do some riding. This is one such day. Tonight my husband will be off at a bachelor party for a friend from church and we figured since I’d be home alone all day it was a good evening for horses. I should start by saying, I suppose, that I am not, in fact, a horse person. Not in the way that true horse people are, at least. Sure, I liked ponies as a kid, I would happily take any chance to ride one, when the rare opportunity arose, but it wasn’t often and I wasn’t heart broken that it wasn’t. I would describe myself as a mild fan of horses. I have accepted that my riding skills will never be impressive, but I still enjoy going out with my friends and sharing n their passion. I will never feel compelled to own my own horse. But I think they’re fun, nonetheless. Kind of scary, but fun. My history with horses is rather brief, despite it spanning my entire life, pretty much. 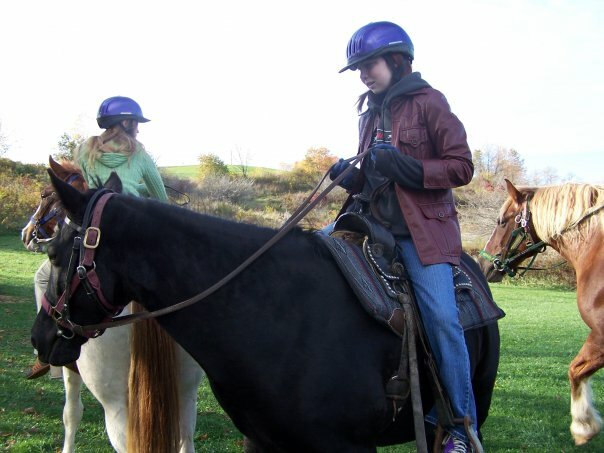 My dad would take us out to ride ponies and horses while we were camping sometime. There’s a picture of him leading each of us around an arena on a pony because we were all too young to ride the big horses. I always got super excited about those little pony rides at the fair with the horses all hooked up to the wheel that kept them going in a circle for kids to ride without the danger of them having any actual control. It was a good time. Outside of those type of events I have two trail riding memories before I met my horse people. My dad and sister and I went on a trail ride with a group from our church. My horse really wanted to not go down into the river again so he decided to do his own thing and tried to run off with me. I’m only really good with horses when they have someone else to follow and I don’t actually have to do anything, so that was a little frightening. The guides told me what to do to stop him, quickly, and instructed me on how to get him back to the group and I was able to do it, which speaks more to the horse than to me. The other time was at a youth retreat my junior year of high school. We were the last group to go and the horses were eager to get back to the stables and eat, so mine was in a bit of a rush when he could. I had to try and keep him from running away with me, more literally this time, back to the starting place where he knew I’d get off and he’d go home. I felt bad keeping him out and I kind of liked going fast, so I probably didn’t reign him in as much as I maybe could have. My main issue with riding horses is that I’m not assertive enough. I learned this last winter as I tried to control a horse on my own while my friend was putting her horse away in order to help me more. My horse wasn’t into me. He really wanted to hang out with Jess, but I was the one on his back so I would try to get him to do things and he would try to bite me. That was our relationship for the day. I also was probably giving him mixed signals because I’m not great with the reigns, either. I have a tendency to forget about where they’re at and pull back while I’m trying to get the horse to go and it’s all very confusing for the poor creature. I’m excited to go out today. I really enjoy the trail riding where I can pretend I’m competent and in control, even though my horse is just doing his own thing with the other horses. I imagine we’ll probably do some arena stuff as well, or it might be too late for the trail so we might just do arena, which might be alright this time since it won’t be freezing. Winter is not a super great time for learning things outside. So we’ll see! Mostly I’m excited to spend time with my friends and partake in an activity that they’re both very passionate about. It’ll be lovely, I’m sure. Have a lovely weekend, my friends!